Furnace gas valves are wired to an electronic component known as a solenoid, which receives signals from the thermostat control. This causes the gas valve to widen or narrow in front of the pilot light to respond to changes in building temperature. 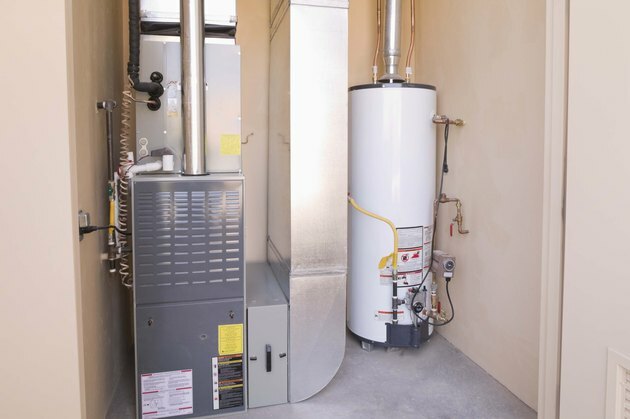 For example, if the temperature in your house falls below the setting on the thermostat, such as 68 degrees Fahrenheit, the gas valve opens to activate the furnace and produce more heat. When the building reaches the desired temperature, a separate signal causes the gas valve to close. Testing with a multimeter lets you know the valve works. The gas valve is inside the furnace cabinet. Turn off the furnace at the wall control. Wait for the unit to cool if it has been in use. Take out the bolts in the service panel on the side of the furnace using a nut driver. Locate the gas valve, which is typically near the bottom of the unit, positioned next to the pilot light. Look for the two wires clipped to the solenoid terminals on the top or side of the gas valve. Pull the wires off the gas valve terminals. Each wire is connected to a push-on clip that slides off the terminal. Write down where the wires connect to the valve so you can reattach them later. Turn the test control on the multimeter to "mV," which stands for millivolt. Hold each tester wand on the multimeter to one of the terminals on the gas valve. A normal reading will be in the range of 145 to 195 millivolts. Readings outside this range indicate the gas valve is defective and must be replaced. Furnace gas valves cannot be repaired.